Sell on your website and get paid more safely and more securely using payment buttons or Express Checkout. Accept payments from credit cards, debit cards and, of course, PayPal. Set-up is faster, easier and free. Choose how to get paid online. To use PayPal payment buttons on your website, you’ll need to access your website’s HTML and paste in a few lines of code. If you’d like to use PayPal Express Checkout, you can integrate it with your website or if you use an eCommerce partner like Magento, Bigcommerce or Shopify. It’s very easy to turn on. Express Checkout offers a quicker, easier payment experience that customers love. 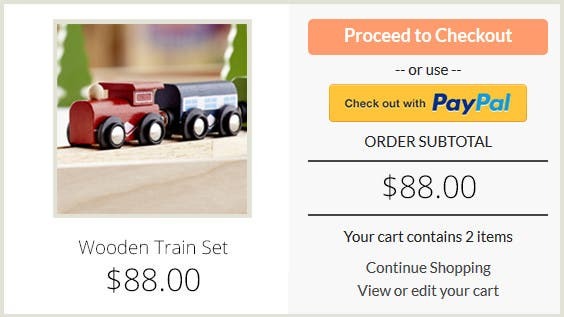 With Express Checkout, we pass your customer’s shipping address to you so there’s no need for them to enter it on your website. Instead, they can check out in as little as 3 clicks, helping to improve user experience and reduce cart abandonment. Getting help with online payment solutions. The easiest way to use Express Checkout is with an eCommerce partner like Magento, Bigcommerce or Shopify. Express Checkout is already integrated with the shop templates, so all you need to do is enter your PayPal API credentials and grant permissions in your cart’s settings. If you have technical expertise in API programming, or have a developer who does, you can integrate Express Checkout yourself. Our Developer Centre provides integration guides, information about our APIs and instructions for completing test transactions. Discover online shopping cart best practices. Learn how to win customer trust online and drive more sales. Save your site from cart abandonment. Avoid high cart abandonment by implementing settings from our cart optimiser on your website. This will help increase the number of customers who complete their purchases. See instructions for Magento, Bigcommerce, Shopify, zencart and much more.